The genesis of any SEO initiative should be identifying the right keywords to target. Unfortunately, we’ve encountered too many marketers and business owners who were actively engaged with an SEO firm yet could not tell us which keywords they wished to rank for. It’s the first commandment of hiring any SEO firm—make sure they start with the end in mind and define success. That’s the cornerstone of our Guaranteed SEO service. Selecting the right keywords for SEO can feel a little bit like picking the right suitcase on Deal or No Deal. I hope this article will you get started. What Does A Great Keyword Look Like? The term “Keyword” can be a little misleading, because most valuable search terms actually include many words. For example, I’d argue that “Audi dealership in Miami” is a more useful keyword to target than “cars.” At least, if you are a South Florida car dealership. The latter is too broad, ambiguous, and likely not going to be used by a searcher who is late in the buying process. If we assume that their is a cost to rank for a keyword in both time and resources, then we should be focused on avoiding keywords that will likely bring us unqualified traffic. The bottom line is that each and every keyword that brings you business can be a valuable asset. But a good keyword strategy prioritizes keywords that bring the least waste (waste referring to unqualified search traffic). With that said, we want to share some experience and pro tips to help you make sure you have the best possible keyword list. When it comes to selecting SEO keywords, the most critical piece of advice I can give you is to ask yourself “is this the language my customer uses?” How do your customers describe what you sell? What are the trends in your industry and the misconceptions that 60% of prospects have when they call you? This is the mindset you need to be in when conducting any kind of marketing strategy. I would steer you towards “dental implants” over “prosthodontics.” “Custom front door” over “individually manufactured wooden doors.” And even “lawyer” over “attorney” depending on the specialty of the practice. It may drive you crazy or break your brand standards, but it will bring you business. When defining keywords: search like your customers do, not like an insider. Question: What do you use a search engine for? My Prediction: The overwhelming majority of (mentionable) searches in your browser history are focused on two things: finding products/services; and searching for information to help you solve a problem. In kind, we typically divide keywords into two baskets. Descriptor Keywords describe your business, product or service. Problem Keywords cover the problems your business solves, the benefits the customer can expect and other topics of “research” your prospective customers might be doing online. Problem Keywords are a great example of longtail SEO (What is Longtail SEO?). Your keyword strategy needs both! Think creatively about how you can use search engines to get an edge over your competition. I believe somes examples are in order. Auto Injury Attorney Can a car accident cause blurred vision? Just like you don’t begin training a newbie boxer to take on the UFC heavyweight champion next month, you don’t focus a company with no existing SEO presence on hyper competitive keywords. It is unrealistic for a brand new website to quickly outrank an established website for the specific keywords that they have been working on for years. But fear not, you can still build a viable search engine presence no matter how late you are to the game. In any market, there is a variety of problems and issues facing your customers. No matter how old the industry, there is going to be new trends. Taking into account the Problem Keyword concept I introduced above, you can still solve problems your competitors have not thought of yet. You can also focus on a specific customer type, application of your product or other niche strategy. In search engines—just as in life—focus is a powerful accelerator. You may have heard about ARMD goals in business. Simply put, the acronym is a checklist to ensure each goal that you set is Actionable, Realistic, Measurable and Dated. This thinking can be applied to keyword selection as well. Each keyword you select is a goal. The very act of having a keyword list covers the actionable and measurable criteria, and a solid SEO firm should be able to help you determine how realistic your efforts will be for any keyword you select. There is no surer way to fail than an ambiguous or unrealistic definition of success; yet that is what I find most companies have when it comes to their SEO initiatives. 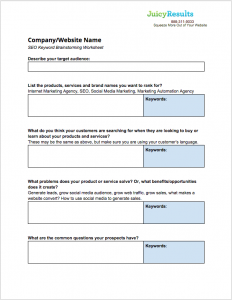 Use this free Keyword Brainstorming Worksheet to develop your own keyword target list for your company. It is a great place to start when contacting us about our Guaranteed SEO program. Great article to share with clients/prospects just waking up to keyword research – thanks Jeremy!